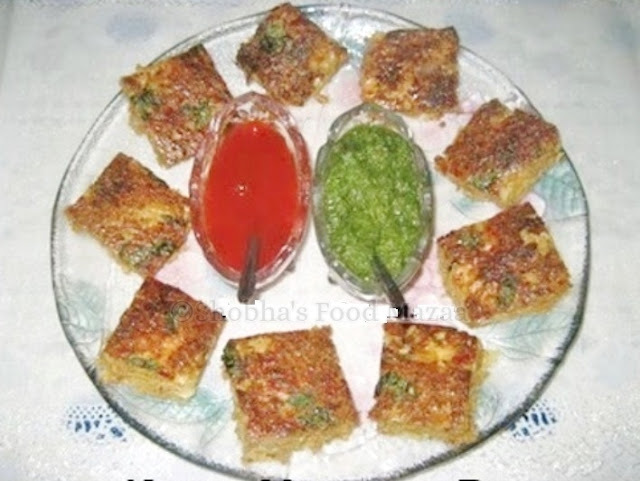 This is a very popular snack made in most of the Sindhi homes. You may also use chicken mince if you prefer that. It is very easy to prepare and since it is a baked snack it is preferred over the other fried ones. Vegetarian version can be made but eggs are must in this as they help in binding. Mutton mince ........ 500 gms. Ginger paste ........ 1 tsp. Garlic paste ......... 1 tbsp. Tomato puree ...... 2 tbsp. Coriander powder .. 1 & 1/2 tbsp. Cumin powder ... 1 & 1/2 tbsp. Garam masala .... 2 tbsp. Red chilli powder ... 1tsp. 1. Heat oil in a pan and fry the onions till golden brown. 2. Add the ginger garlic paste and green chillies. Saute and add the mince. 4. Saute the keema adding a little water and simmer it to cook until done. It has to be dry. Let it cool. 5. Meanwhile boil the macaronis with a little salt, drain and set aside. 6. Beat all the eggs in a bowl with a little salt. 8. Mix the remaining portion of the dry masalas and check the salt. 9. Grease a baking tray and pour the mix into it. Spread the remaining egg on it and sprinkle a little garam masala and red chilli powder. 11. Let it cool and cut into pieces. Serve with mint chutney and sauce. Looks so good and inviting. Guna: Welcome to Food Mazaa. Thank you for the visit and the kind comment. Very unique recipe and iinovative too. Love it. Khaddy: Thank you. This makes for a good snack item. Hi Mona: Thank you very much. liked ur idea of mince n macaroni...too good. We Sindhis use macaroni in lot of dishes..even make a curry. first time in your blog, and I really like it, you have some really delicious recipes worth trying! keep up the good work, i've already bookmarked few tempting ones to try soon..thanks for sharing. Welcome to my blog Jehanne..
hi shobha, this looks like a great way to prepare macaroni- with mutton and a spicy touch. we dont have spicy varieties sold here. have a nice day, how was your brazil trip. Ha ha .. nice that you are also enjoying the Indian music while browsing through the blog. Delicious Keema Macaroni Bake,looks so inviting. hi shobha.. simply delicious especially when eaten hot.. So glad that you are liking and learning from my blog posts. luv the mince and macaroni..sounds too delicious.. Thanks Priya.. it is a lovely combo. delicious and innovative recipe... thanks for linking to my event... I think there might have been some problem with the linky... I just checked, it is working fine now... Please try linking again... Thanks..
Kheema macaroni looks good.. You always come up with innovative recipes.. Thanks for sharing! Thank you for liking my recipes. Interesting idea Shobha didi. Keema with macaroni and that also baked! Lipsmacking good.